The readings for this Sunday demonstrate the unfathomable love our Father has for us and also teaches us about the love we should have for each other. Our Gospel reading (Luke 15:1-32) is a collection of three parables, each demonstrating the lengths to which the Father will seek out and rejoice over even one of his lost sheep. First, are the parables of the lost sheep and the lost coin. "So to them he addressed this parable. 'What man among you having a hundred sheep and losing one of them would not leave the ninety-nine in the desert and go after the lost one until he finds it? And when he does find it, he sets it on his shoulders with great joy and, upon his arrival home, he calls together his friends and neighbors and says to them, 'Rejoice with me because I have found my lost sheep.' I tell you, in just the same way there will be more joy in heaven over one sinner who repents than over ninety-nine righteous people who have no need of repentance. 'Or what woman having ten coins and losing one would not light a lamp and sweep the house, searching carefully until she finds it? And when she does find it, she calls together her friends and neighbors and says to them, 'Rejoice with me because I have found the coin that I lost.' In just the same way, I tell you, there will be rejoicing among the angels of God over one sinner who repents.'" Then, to drive the point home, Jesus told perhaps the most famous of his parables, the Prodigal Son. Not only does this remove any doubt about God's love, mercy and forgiveness, but it also draws a stark contrast with the older son's unwillingness to love and forgive. After squandering his inheritance on debauchery, the prodigal son came to his senses and returned home, hoping to be counted among his father's hired workers. "So he got up and went back to his father. While he was still a long way off, his father caught sight of him, and was filled with compassion. He ran to his son, embraced him and kissed him. 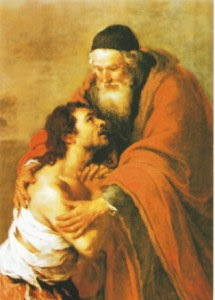 His son said to him, 'Father, I have sinned against heaven and against you; I no longer deserve to be called your son.' But his father ordered his servants, 'Quickly bring the finest robe and put it on him; put a ring on his finger and sandals on his feet. Take the fattened calf and slaughter it. Then let us celebrate with a feast, because this son of mine was dead, and has come to life again; he was lost, and has been found.' Then the celebration began. Now the older son had been out in the field and, on his way back, as he neared the house, he heard the sound of music and dancing. He called one of the servants and asked what this might mean. Our first reading (Exodus 32:7-11, 13-14) is another, rather folksy tale of the Father's willingness to forgive the transgressions of his people. "The LORD said to Moses, 'Go down at once to your people, whom you brought out of the land of Egypt, for they have become depraved. They have soon turned aside from the way I pointed out to them, making for themselves a molten calf and worshiping it, sacrificing to it and crying out, 'This is your God, O Israel, who brought you out of the land of Egypt!' 'I see how stiff-necked this people is, ' continued the LORD to Moses. Let me alone, then, that my wrath may blaze up against them to consume them. Then I will make of you a great nation.' But Moses implored the LORD, his God, saying, 'Why, O LORD, should your wrath blaze up against your own people, whom you brought out of the land of Egypt with such great power and with so strong a hand? Remember your servants Abraham, Isaac, and Israel, and how you swore to them by your own self, saying, 'I will make your descendants as numerous as the stars in the sky; and all this land that I promised, I will give your descendants as their perpetual heritage.'' So the LORD relented in the punishment he had threatened to inflict on his people." Our Epistle reading from the First Letter to Timothy (1 Tim 1:12-17) is yet another example of God's mercy and forgiveness, this time to Paul who was once a persecutor of Christians. "Beloved: I am grateful to him who has strengthened me, Christ Jesus our Lord, because he considered me trustworthy in appointing me to the ministry. I was once a blasphemer and a persecutor and arrogant, but I have been mercifully treated because I acted out of ignorance in my unbelief. Indeed, the grace of our Lord has been abundant, along with the faith and love that are in Christ Jesus. This saying is trustworthy and deserves full acceptance: Christ Jesus came into the world to save sinners. Of these I am the foremost. But for that reason I was mercifully treated." So, after these three readings, there should be no doubt. God loves us and looks for any opportunity to forgive us and rejoices as our repentance and return to him. How do we know? The bible tells us so.